Wild Belle이란 듀오의 인터뷰에서 Chris Frantz와의 인연을 이야기하고 있다. 사운드가 Tom Tom Club을 연상시킨다. NB: …A really exciting moment because Tom Tom Club…Talking Heads… you know it is just some really, really brilliant musicians and now Chris is like; “Hey, if you guys want to lay down a track…” we are like: “Hell yeah!” He has a studio close to New York and that’s something we are excited about, potentially doing in the near future, working with them. As of now, we have sort of… the record has been very hands on. The two of us with some help from friends and the engineers at the studio, but we have molded and shaped this album that has become what it is, so it is exciting that we get to eventually share the work that we have done together with the world. But in the future, of course there are lots of artists that we would be excited about working with. 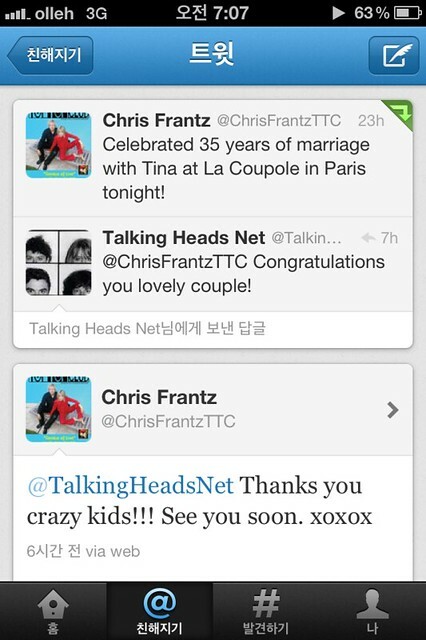 Chris Frantz님께서 트위터의 내 계정(@TalkingHeadsNet)을 팔로우하셔서 감동먹고 편지를 보냈더니 친히 답장을 해주셨다. 신곡을 준비 중이시라는 “Working on some new tunes now!” 내 원래 DM과는 약간 동떨어진 내용이지만 팬의 입장에서는 여하튼 감동의 도가니탕이랄 수밖에….